During the first three decades of the 20th century P.J. Monahan was one of New York's most prolific illustrators. He created ads, movie posters, commissioned art but the majority of his work was for the "pulp" magazines of the day. His paintings were noted for composition, design and use of colours -- stimulating images full of romance and adventure. Sadly the work of P.J. Monahan and the other pulp artists of that time have not received the recognition of their contemporary illustrators, whose work appeared in art galleries and the "slick" magazines. 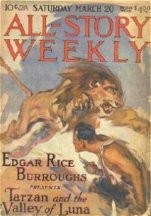 Of particular interest to followers of the works of Edgar Rice Burroughs are the artists of who illustrated the pulp magazines in which most of ERB's stories first appeared. Before seeing release in hard cover, Tarzan et al appeared in the Argosy/All-Story/Cavalier and Munsey's magazines as well as in Blue Book, Red Book, Amazing, Modern Mechanics & Invention, Fantastic Adventures, Thrilling Adventure Stories, and even Liberty. 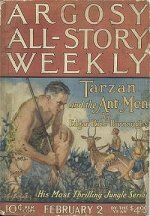 The best known illustrators for these magazines were P. J. Monahan, Modest Stein, Clinton Pettee, Stockton Mulford, Pahl Stahr, and of course the great J. Allen St. John. 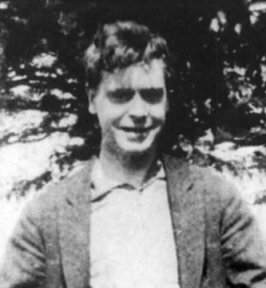 Between 1913 and 1923 P.J. 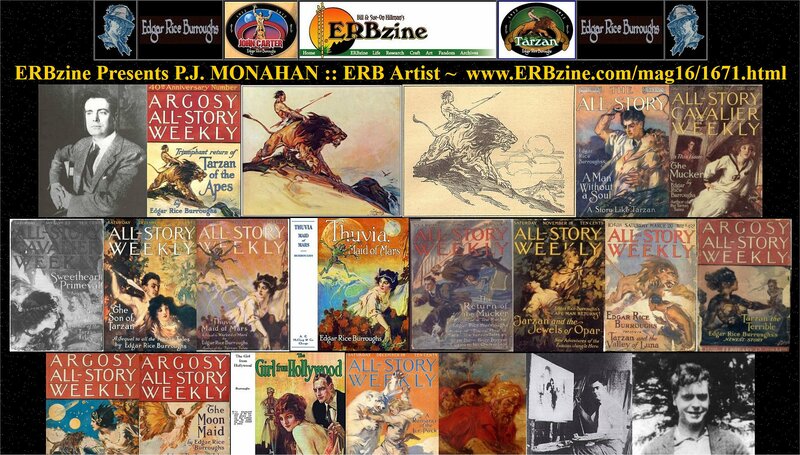 Monahan painted wonderful covers for 13 All-Storys that featured ERB stories. Patrick John Sullivan (Monahan) was born in Des Moine, Iowa, on January 4, 1882. His parents, John and Mary, had immigrated from County Cork, Ireland in the '70s via Boston to a homestead in the Des Moines area. The Sullivans had three children, Patrick, Eugene and Anne. The only two members of the Sullivan family to survive the flu epidemic of 1891 were Patrick and Eugene. The boys were taken in and raised by neighbours Rose and Jim Monahan. Patrick won a four-year art scholarship to Drake University of Ministers where his artistic talent bloomed. This talent won him a first prize at the St. Louis Exposition and the opportunity to further his art studies in Europe, where he went on to win more awards and even painted a full-figure painting of Pope Pius X. After graduation he worked as a newspaper illustrator in Chicago and St. Louis. On October 24, 1905, Patrick married Louise Cecelia Averill, much against the wishes of her family, who were staunch Protestants who objected to his Catholic and orphan background. After the birth of their first child, Cecelia, they moved to New York where Patrick worked at illustrating fashion catalogues. His reputation grew and soon he was painting covers for Leslie's Weekly, The New Broadway Magazine, The Delineator, and Judge Magazine. In 1909 his work was featued with that of 16 other top artists to appear in the collection, "Judge Art Prints." This led to work for higher class magazines and by 1911 he was doing interiors for The Ladies Home Journal, Cosmopolitan, Leslie's Weekly, Pearson's Magazine, The Hearst Magazine and Hampton's. He kept a small studio in New York in the Printers Craft Building, but was now able to afford to move the family to a more upper class area in New Jersey. 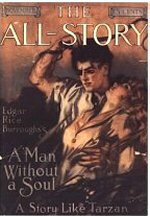 By 1912 he was doing cover work for syndicated newspapers across America, colour illustrations for New York World newspaper and he also did the cover and eight interiors for his friend Jack London's book, Smoke Bellew. He was invited to become a member in the Society of Illustrators headed by Charles Dana Gibson (creator of the "Gibson Girl") and became friends with artists such as James Montgomery Flagg, Norman Rockwell and many other top artists of the day. 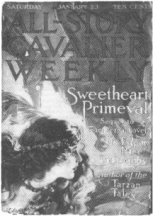 Contracts with Street and Smith Publications provided steady employment for titles such as: Air Trails, Western Story Magazine, Detective Story Magazine, People's Magazine, etc. 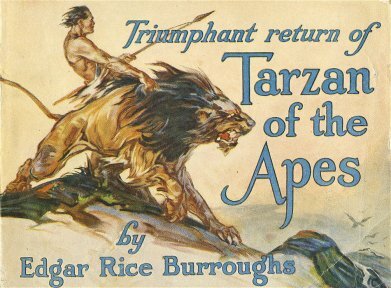 His imaginative composition, design, use of colours and his stimulating images full of romance and adventure were soon providing ideal illustrations for Munsey's stable of adventure writers: Edgar Rice Burroughs, Rex Stout, H. Bedford Jones, Frank L. Packard, J. Allen Dunn and George Allan England. 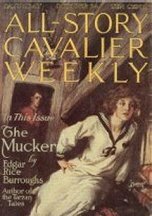 Soon he was producing colour cover paintings ($125 each) for the Munsey pulp magazines: Munsey Magazine, Argosy, All-Story, Cavalier, and Railroad Man's Magazine. 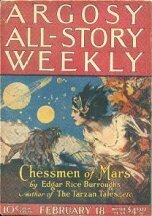 In 1912, Robert H. Davis and Thomas Metcalf of The All-Story Magazine published the first installment of an unknown writer's first novel: Under the Moons of Mars in the February issue. 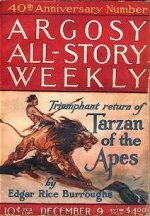 Response for this unique romantic science fiction tale was so overwhelming that they followed it up in the October issue with another of the author's highly imaginative tales -- Tarzan of the Apes -- with a cover illustration by Clinton Pettee. This proved to be the start of a new era of pulp fiction in which P. J. Monahan would play a major part. 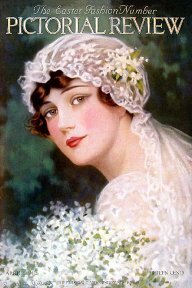 Through all his work for society magazines and fashion catalogues, Monahan had developed a special skill in the painting of women. This talent would serve him well in the crafting of pulp adventure covers. Monahan's colourful heroines exuded an air of innocence, femininity, and romance that appealed to both sexes. He also did all his own lettering -- and was often called upon to paint over the original magazine lettering to adapt the paintings for use on dust jackets for hardcover book releases. 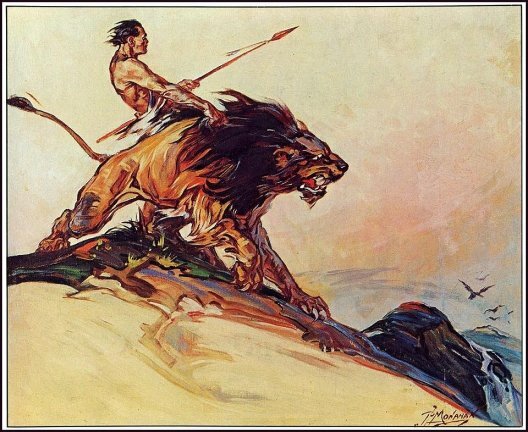 Besides this regular work he freelanced for even more magazines -- Adventure, Woman's Magazine, Pictorial Review, The Designer, Colliers -- and doing covers and interior illustrations for numerous books. P.J. had many other interests and achievements besides magazine and book illustrations. helped in the war effort in 1917-18 by producing propaganda materials and paintings for Liberty War Bond drives. painted movie posters and magazine ads for Fox studios using images of the popular stars of the day: Tom Mix, Hoot Gibson, William S. Hart Mary Pickford, Douglas Fairbanks, and D.W. Griffith's "A Birth of a Nation." painted some of the most beautiful models in New York -- many of whom went on to become famous on stage and screen and the Ziegfeld Follies. friend and fellow-artist Robert Ripley went on to gain fame with his "Believe It or Not" syndicated feature. 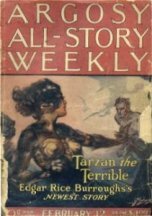 Between 1913 and 1923 -- at the request of Edgar Rice Burroughs -- P.J. painted all 13 of the covers for the Argosy/All-Story pulps featuring ERB stories. 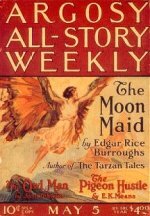 The first was for "A Man Without A Soul" -- a painting for which he himself posed -- and the last was "The Moon Maid." 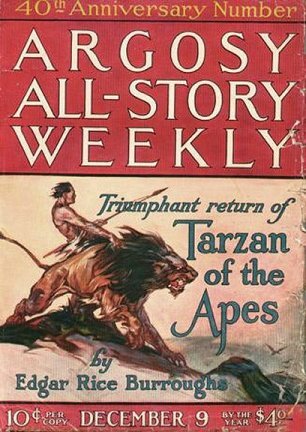 The model for most of the Tarzan covers was a P.J. regular, Joe Murray -- in fact, Murray's image pre-dated the well-known Elmo Lincoln's film appearance. 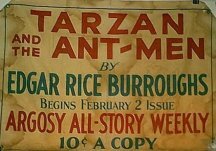 Curiously, the last cover painting he was paid for ($150) was that of "Tarzan and the Ant Men," but the cover was never used. 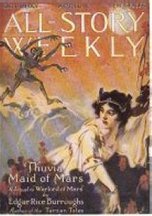 Surprisingly a different cover by Stockton Mulford appeared on the February 2, 1924 issue. It has been suggested that P.J. 's rendering of the ant men with faces resembling those of real ants did not match the Burroughs description. After choosing appropriate scenes to illustrate -- often with the help of his wife Louise -- P.J. would make preliminary sketches which he would submit to the Munsey art director for approval. He then sketched the image onto a 24" x 36" canvas using brown tones of oil paint and then took a day or two to finish the painting in full colour. P.J. kept ownership of the canvases and after they were returned he stored most of them in his NY or NJ studio. All of these paintings -- except for the Tarzan and the Golden Lion painting that was purchased by ERB -- were either sold or given to friends . . . or tragically lost in a fire that demolished his New Jersey studio. 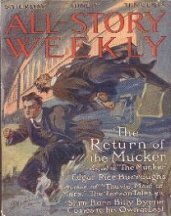 After leaving Munsey's in 1923 he continued to work for Street and Smith, often turning out a cover a day for magazines such as: Action Stories, People's Magazine, Complete Novel Magazine, Complete Story Magazine, Love Stories and numerous others. The main impetus for this demanding schedule seemed to be his determination to make good the money lost by friends who had invested in his failed rotary engine project. P.J. 's lack of business sense led to Louise stepping in to serve as his business manager. Partly because of Louise's health problems they bought a 32-acre farm in 1924 and eventually converted part of a three-storey barn on the property into a studio. P.J. left Street and Smith in 1926 and started work for George T. Delacorte, Jr.'s Dell Publishing Co. -- doing increasingly boring romantic cover and interior illustrations for Sweetheart Stories and Cupid's Diary. He also did covers for Fiction House Publications' Love Romances. In 1927, King Features hired him to produce a daily newspaper strip adaptation for Shakespeare's classics: Romeo and Juliet, Hamlet, The Merchant of Venice, Macbeth, and Taming of the Shrew -- as well as others such as Dickens' Pickwick Papers. By this time some of his kids were helping with reading manuscripts for cover ideas, as well as working as his inkers and models. 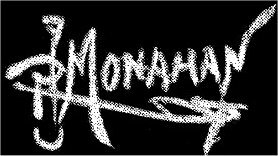 A series of tragedies hit the Monahans in 1928. The barn and studio burned down, destroying 200 Monahan paintings, art supplies and P.J. 's art and book collection. Soon after he was involved in a traffic accident and the resulting head injury plagued him with severe headaches which affected his work and creativity for the rest of his life. 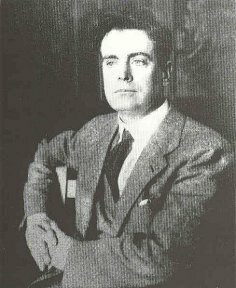 Patrick Monahan died of a massive cerebral hemorrhage at age 49 on November 1, 1931. He is buried in St. Mary's Cemetery at Wharton, New Jersey. Louise never remarried and raised their eight children on their farm. She died at age 84 on June 12, 1968 and was buried alongside her husband. I am the youngest son, James George Monahan, of P. J. Monahan. I am now 81 years of age. 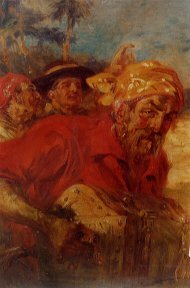 I am in possession of an original oil painting – The Pirate – painted by my dad. I also have several illustrations and original copies of Argosy and other pulp magazines that collectors may be interested in. 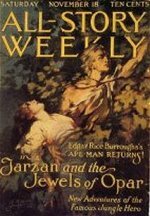 Editor's Note: I have suggested to James that many ERB fans would be interested in the items in his collection that feature PJM art. Below is a list of items that Mr. Monahan would be interested in selling to collectors at fair market prices. Also available is the original oil, "The Pirate," shown in the illustration above. This whole thing gives me goose bumps! I am Gillaine St. John Monahan, Jim's second wife after the death of his 50-year marriage to first wife Barbara. They had seven children. Jim is the most amazing man I have known and probably the most like his dad as far as I can tell and even though his dad died tragically when he was only 7 years old. He is the youngest of eight and four siblings are still alive. We live in Ely, Minnesota. I was intrigued when I saw so much about J. Allen St. John along with P.J. Monahan (on the ERBzine site). Upon reading his bio find that I am related! My grandfather is Samuel St. John whose brother was Levi, grandfather of J. Allen. My Dad would tell the story about being the first white baby born in Rock County WI and he was! I always thought he embellished on the real story. Gilbert St. John and hence my first name - Gillaine. I was first born. I have traced my family to Samuel who died in 1936 shortly before I was born and my Dad died tragically when I was 17 so I am very happy to be able to piece this story together.